I've top-notch expertise and experience in the following skills. It'd be great if the skill/s you're looking for are listed and you've clear understanding of your issue. If you're not sure about the issue, don't worry I can assess it, suggest you best solution, and resolve it within reasonable budget and time frame! 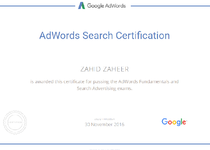 1- Google Adwords (Certified): I've set/managed/optimized hundreds of adwords accounts, small and large, in almost any business niche! I don't think your job could go beyond my expertise - be assured! 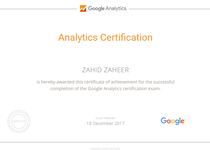 2- Google analytics (Certified): I've integrated/set tens of analytics accounts (using Tagmanager) for detailed analysis of site, visitors, goals, eCommerce, etc. I don't think your issue could go beyond my expertise - be assured! 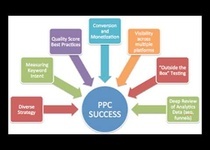 3- Facebook Business (PPC): I've been setting/managing/optimizing Facebook advertising since many years, since its taking evolving to Facebook Business. I don't think your Facebook job could go beyond my expertise - be assured! 4- Amazon Sponsored Ads (PPC): I've set/manage/optimize many Amazon SponsoredAds/PPC account for eCommerce companies and help out in lowering ACoS and improving Conversion Rate and Sell! 5- Google DoubleClick (DFP): I've integrated DFP on many sites to monetize or optimize their advertising revenue by improving ads RMP. In-house, popular networks and affiliates offers can be advertised by DFP smart inventory management system. All desktop and app sites could benefit. 6- Other Skills: I've strong concepts in SEO, SEM, and SMM, while basic concepts in HTML, PHP, Java, FTP, DNS, Hosting, and programming to meet script/code/tag/pixel updating where required. I've reasonable skills in site/page/app development/management applications, like: Wordpress, Magento, Joomla, Shopify, PrestaShop, Optimizely, Unbounce, Instapage, etc. Started career as an IT professional quite before my Graduation, I accumulated over decade of experience in business entrepreneurship, planning, programming, marketing, development, and management. Set Google Tagmanager to help manage Analytics and Adwords Conversion. 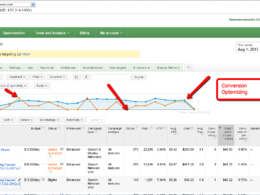 Optimize Your Adwords results - Higher CTR & Conversion! 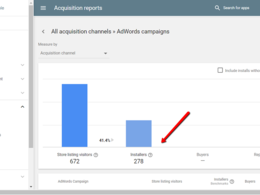 Audit Your adwords Account and Suggest Ways to Improve Conversion & ROI! He cheated Google previously and got all his adwords account/s and site/s suspended. 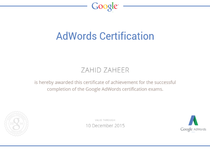 He assigned me job to setup up and run his/her adwords campaign on my adwords account. I completed the job (set up adwords campaign and run it) and sent him screenshots, despite that he insisted to see billing information/screen, that I'd never show him. Even then I show him campaign setup and spend through Skype screen sharing, but he insisted continuously to see my adwords/billing detail :-( I warn all friends not to share any personal account detail/screen/report with him, as he'd misuse that and get you suspended too as he got for himself. Thx. Excellent provider. Will work with him in future too.